The M/V Citrus, a freighter, collided with another ship while loading cargo at sea off of St. Paul Island in the Pribilofs in 1996. The collision punctured some of the Citrus’s fuel tanks resulting in bunker fuel oil leaking into the sea oiling and killing wintering waterfowl and seabirds. 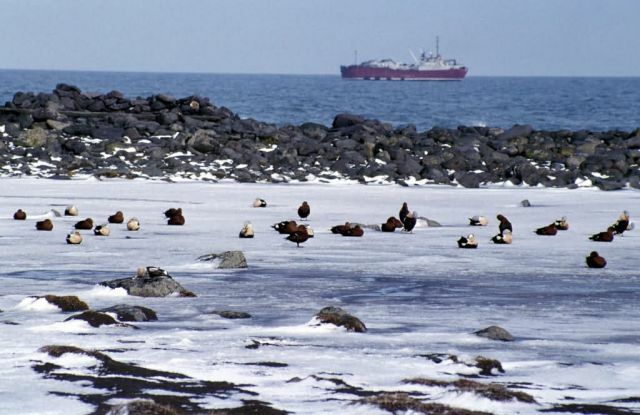 Oiled king eiders such as these shown came ashore on St. Paul Island because their oiled feathers could no longer keep them warm at sea. Most died. Foxes and carnivorous birds scavenged the carcasses resulting in even greater numbers of death.